We have that Bible story book!! I haven't read that Dolly Parton book in a long time. I'll have to get it for my girls. We have several Bible storybooks, but I haven't heard of this one. Nice that it has the song cd to go with it. I'm familiar with the Dolly Parton book, but I haven't read it. We'll have to look for that one. I love your art project too! I linked here from Amy's Read-Aloud Thursday. I enjoyed perusing your Book Reviews and found a few titles I'm not familiar with and want to locate. Love the art project to tie in with the Bible story!! What a great momma you are. Blessings as you train up your little flock in the way they should go! Thanks for stopping by and commenting on my tippy-toe photo of my baby grand. Blessings. I was just thinking about that Bible story today and what we could do. Great idea, we will have to try something like this, when we do I will make sure and link back to you. The coat looks so cute! I'm always looking for ideas, that can be put together quickly on those Sunday mornings when sickness forces us to miss Sunday school. Thanks for sharing this one. 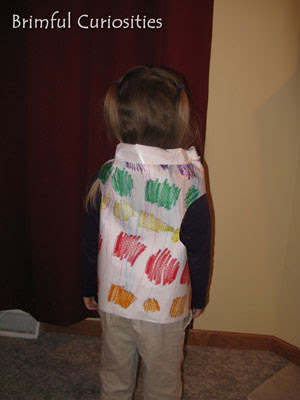 The coat turned out so cute and I love that you used freezer bags to create it. What a great idea! 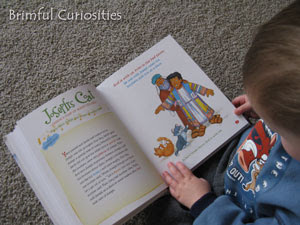 I love the craft addition to the Bible story lesson! 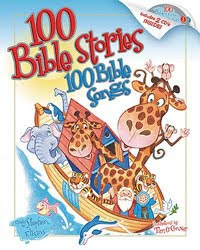 Just a note from us (Tommy Nelson - the publisher of 100 Bible Stories, 100 Bible Songs): the other books in this series by Stephen Elkins DO have the songs listed on the pages to help you find the right one :) Great point! This week we are featuring these books on twitter: @TommyNelson and in a contest @ http://bit.ly/BGm9Q. 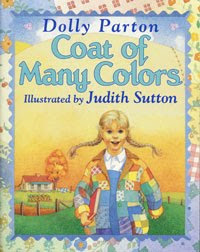 We love the Dolly Parton book, Coat of many colors. It was one of my favorite songs growing up and now I enjoy reading the book with the Daycare kiddos.. I will be looking for the bible story book. Oh Dolly's book. I had forgotten about it. I had bought that book for my 18 year old when it first came out. I really enjoyed it. Whatever became of that book? Great art project based on the Bible story. What a creative idea! I like the coat.